What counts as a "new" way to add to 10? Can you find all the ways to add to 5? 6? Here's how I set the game up: I asked my son "How many ways can you add to four?" He said "1+3, 2+2, and 3+1. Three ways." "Should we really count 1+3 and also count 3+1? Those feel sort of the same to me." My son agreed. So then I said "We've found two ways so far, but did you know there are more? For example, you could add 1+1+2, or you could add 1+1+1+1"
"Or you could add 4+0"
So then I pose my real question: How many ways can you add to 10? 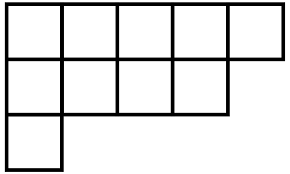 This puzzle is an introduction to the idea of partitions, which is a really fascinating aspect of number theory. I love when you can pose a math problem in such a way that a child in elementary school can understand it, yet the underlying math can be explored by professional mathematicians. But enough about partitions. I want to tell you why this math puzzle is helpful for your child, long before they take a number theory class. First, it helps young kids build fluency with addition. Fluency, in this case, means being able to add numbers easily, flexibly, and accurately. Giving your child a math problem to explore will certainly help them build those addition skills as they search for new and inventive ways to add to 10. Secondly, this puzzle might prompt older kids to build their strategic problem solving skills. They no longer have to think hard to add to 10, but they still have to think hard about whether they have found all the combinations. Try the problem out yourself. You'll see what I mean. Ok, now you're back. So, how did you keep track of your answers? Did you start with all the pairs of addends, then move on to problems with three addends? Or maybe you started with 9+1, then 8+2 and 8+1+1, then worked your way down to 1. In either case, as you worked further through the problem, you likely began to build in some structure to your problem solving. Kids need experience with these sorts of open-ended problems so that they can also become accustomed to finding the structure of the problem and using it to help them stay organized. I'll be honest: I don't expect my son to find all the combinations of numbers that add to 10. But that's not the point. The point, for now, is is the exploration. So I might ask my son "Have you tried to find all the ways to add to 5? What about 6?" Giving him a more approachable number is a great way to help him practice with the problem without getting overwhelmed by his options. With an older student, I might ask "What counts as a new way to add to 10?" Typically, they will have an answer such as 1+2+3+4, only to realize that elsewhere in their work is 4+2+3+1! For the sake of sanity, we should probably just count that as one way to add to 10. Can you even imagine trying to find all the ways to order all the numbers that can add to 10? The last question I'd ask is "What's your approach to this problem?" Simply by asking, you indicate to your child that they should be looking for some sort of strategy. That strategy can be as simple as randomly picking numbers, at first, but over time they'll find the need to develop deeper structures to help them organize their work. Feel free to give them a hint on how to proceed, but don't solve the puzzle for them. You wouldn't ruin the end of a great mystery novel, so don't rob them of this experience either! By the way, I'm not telling you how many ways there are to add to 10. But if you figure it out, I'll shout you out in next week's email!